So we're pleased to present the 131st in our series of Saturday matinees today: a double feature on Julia Margaret Cameron. You'll learn that at the age of 48 her daughter gave her a camera for Christmas and she spent the rest of her life turning everyone from her servants to her neighbors, including Alfred Lord Tennyson, into models. Lyden points out that Cameron used soft focus to "create a sense of the sitter." There's also a slight sense of motion (from long exposures) in some of her portraits that Lyden suggests gives them a three-dimensional sense in the way Giocometti's scribbles suggest movement. Near the end of it, she describes Cameron's working methods. "There are a lot of opportunities to make mistakes," she points out, when working in the wet collodion process with large fragile sheets of glass coated in several chemicals. The existing prints are full of flaws from just such mistakes. Scratches. Smudges. Fingerprints. From Cameron's "exuberant character." Which, Weiss says, show these are handmade objects, a human touch in the images. What we see as imperfections were likely just that. A cumbersome process Cameron had no hope of perfecting without them. The price she willingly paid to create her romantic images. Her heroes, her legends. The Angel at the Sepulchre. She has been at our side for many years now. We have for many years kept a small reproduction of The Angel at the Sepulchre, which is in the collection at the Victoria and Albert Museum. We liked the name (how could you not?) to begin with. The title "refers to the angel that appeared at Christ's tomb after his resurrection, though in the biblical account the angel was male." Cameron posed Mary Hiller, her maid, as the angel. Cameron described Hiller as "one of the most beautiful and constant of my models, and in every manner of form has her face been reproduced, yet never has it been felt that the grace of the fashion of it has perished." And it is Hiller's image that captivated us long ago and to this day. 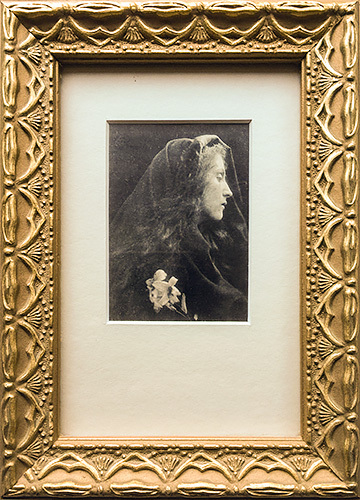 She looks to the right in profile, wearing a dark veil, the only white in the image her face and the lily at the bottom of the frame. A painterly composition for which the Pictorialists, arguing for photography as an art, were noted. There is a ghost-like mottling on the veil that could be hair or a simply a technical flaw. But it somehow doesn't distract. It suggests this image has been created. It's from another world. Some interpreters think the image is of Mary Magdalene, "penitent prostitute who was the first to see Christ following his Resurrection." You might read into that the vindication of a photographer pretending, like a prostitute, to be among the holy artists. Or just a maid with a lily pretending to be an angel. And somehow turning out to be one after all -- in the hands of an artist.